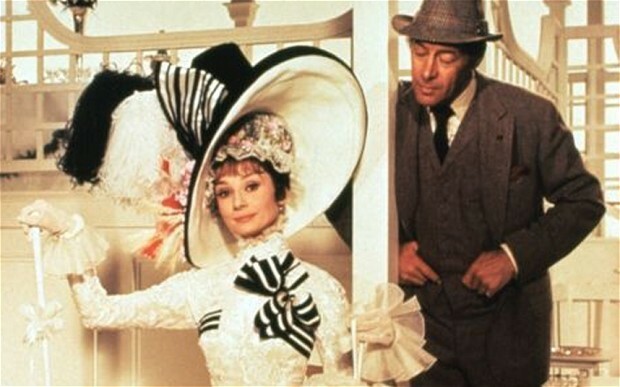 Today I had the treat to see the musical classic My Fair Lady on the big screen! It is a specially remastered edition and even included the intermission. It’s amazing how with a great film 3 hours goes by without me even noticing it; whereas, I’ve sat for 1 hour films and been very antsy. 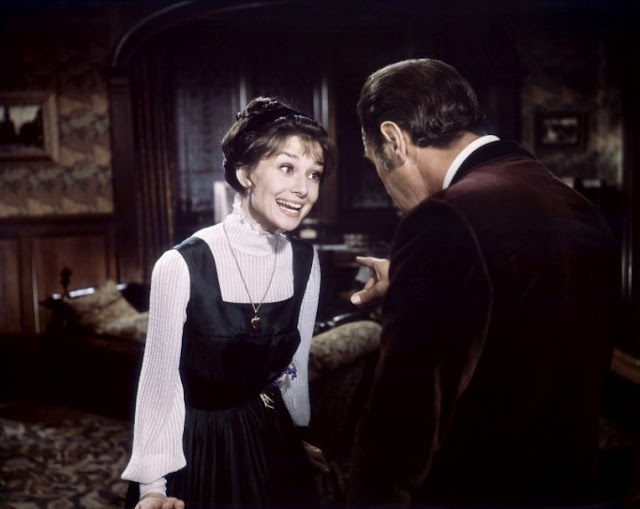 I hadn’t seen My Fair Lady for a little while but I listen to the music quite often. Let’s just say it was even better than I remembered it. 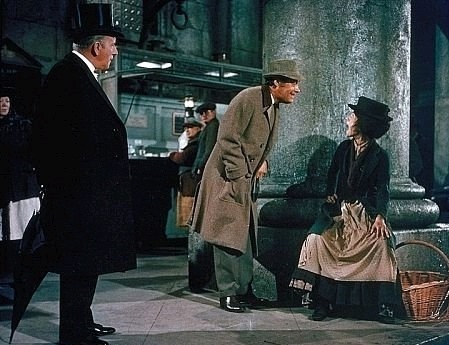 My Fair Lady was of course based on the Lerner and Loewe Broadway musical, which in turn was based on the George Bernard Shaw play Pygmalion. 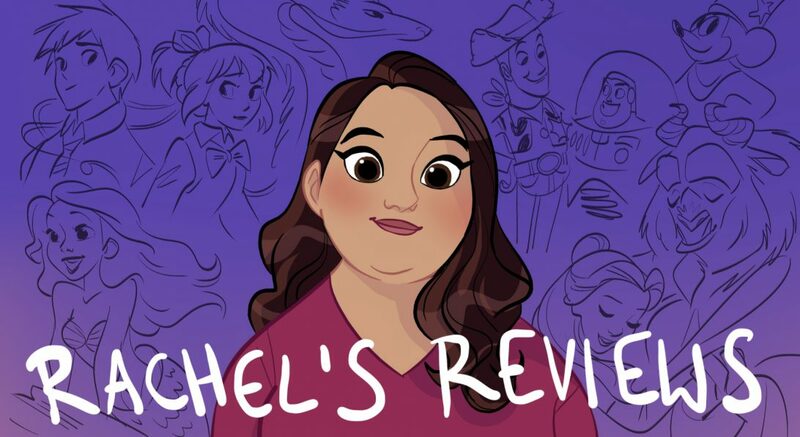 It is basically a variation on Cinderella with the homely girl finding out she really is a princess (which British nobility and genteelness basically is). We’ve seen it in Princess Diaries, What a Girl Wants and many other films. While the plot may not be groundbreaking it is executed with such warmth, humor and charm it made me smile from beginning to end. 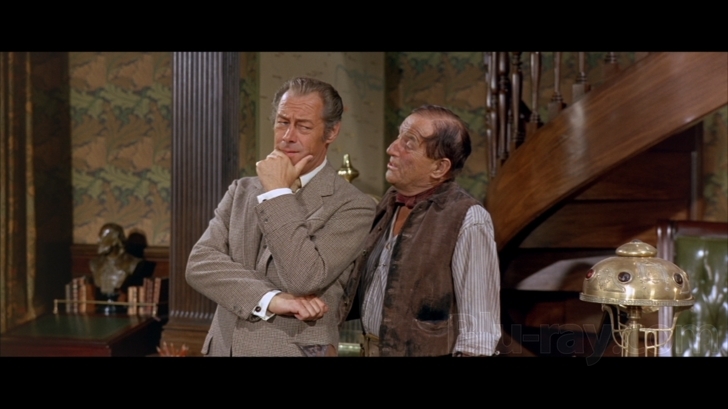 Rex Harrison was famous for playing Henry Higgins on Broadway and his live singing with the speech singing style is proof of that kind of nightly performance you get on Broadway. Some people may see Higgins as a bit of a pig but I think the movie knows he is a pig and for the most part Eliza is up to the challenge and certainly doesn’t back down to his bullish ways. While watching Higgins I kept thinking of Sherlock Holmes or Sheldon Cooper, these characters we see from time to time who are selfish but kind of in an innocent way. They see their world as making the most sense and everyone else should just come around to their genius. I guess if you don’t know Henry Higgins is a professor of the science of speech. 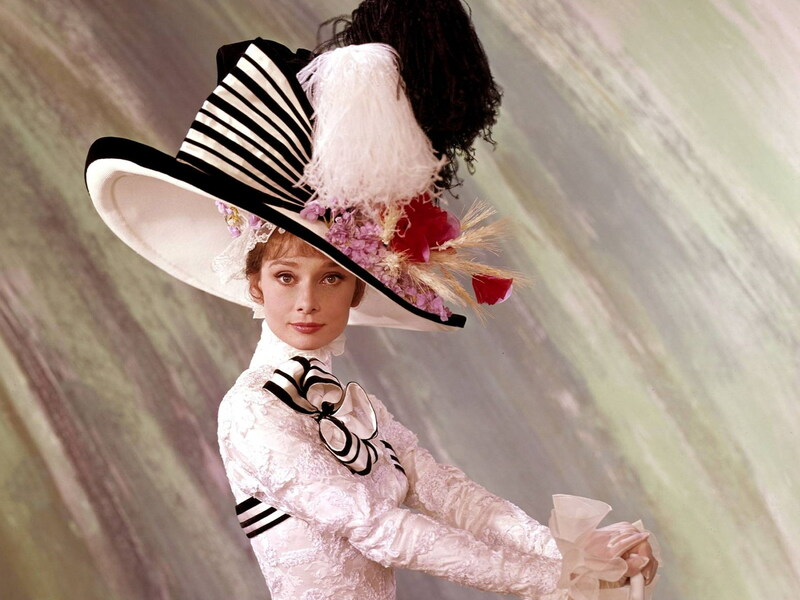 One day he meets a Cockney flower girl named Eliza Doolittle played by Audrey Hepburn. She overhears Higgins boast he could teach her to be a duchess at a ball, so the next day she makes a proposal to him to pay for lessons. This starts Higgins, Doolittle and their friend Colonel Pickering (Wilfrid Hyde-White) on a 6 month struggle to change the way Eliza speaks. Eventually Eliza is tested out at the Ascot Raceway where she can’t help but be a little competitive. 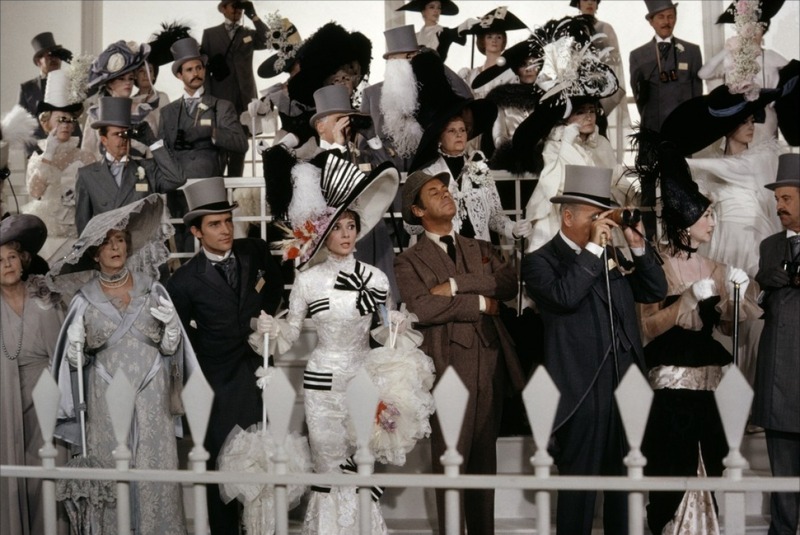 The costumes by Cecil Beaton during this segment and the ball later on are some of the greatest in movie history. Cecil Beaton not only won Oscar for Costume Design but also for Art Direction which is also outstanding. Notice Eliza is the only one with any color to her hat. The hats alone are works of art. George Cukor does a fine job directing the film with an ease and flow and an incredible attention to detail. 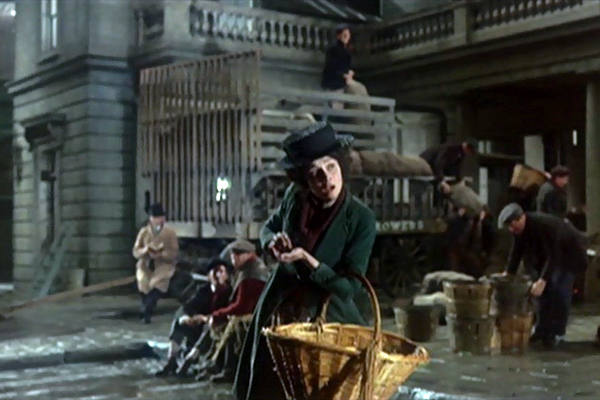 Henry Stradling’s cinematography and the art direction make each scene a joy to watch whether it is a street in London, Ascot or the Ball. George Groves weaving sound mixing of Harrison’s live singing with the dubbed singing of Hepburn and others is also remarkable. 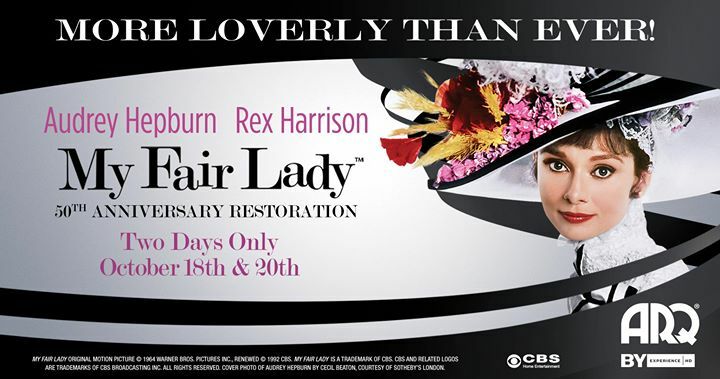 My Fair Lady still holds the record I believe for 8 academy award wins. Some people were upset at the time Julie Andrews wasn’t chosen to pay Eliza but with Hepburn winning an Oscar for playing a princess in Roman Holiday the choice made sense and I think she is lovely in the part (as I’m sure Andrews would have been but then we might not have gotten her in Mary Poppins!). 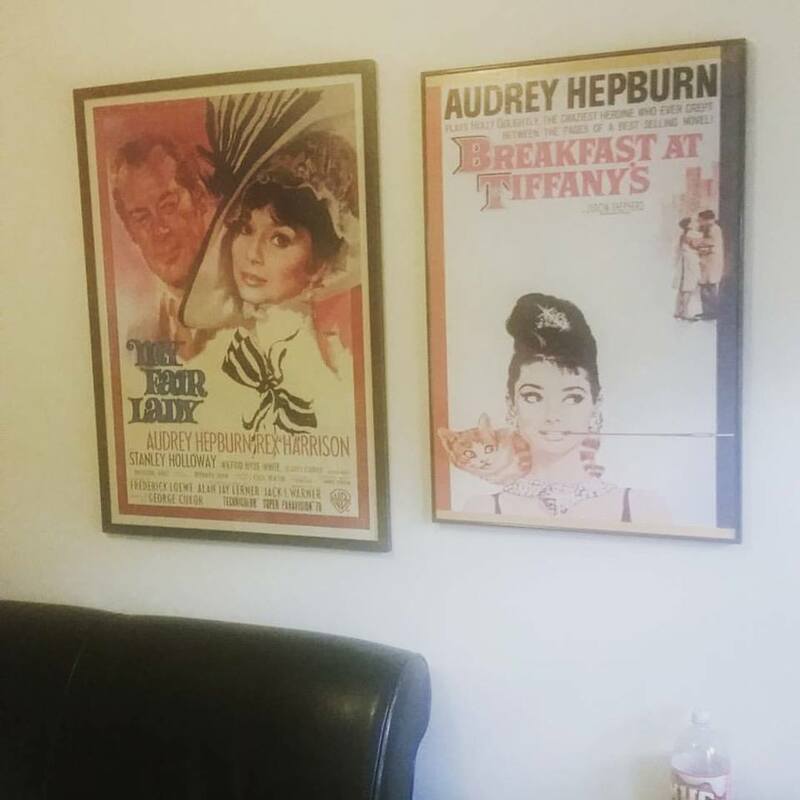 Marni Nixon does the dub work for Hepburn and what a pro she is. To think she is the same singer for Deborah Kerr in The King and I and Natalie Wood in West Side Story it is pretty amazing. The music is so divine. Wouldn’t it Be Loverly, The Rain in Spain, I Could Have Danced All Night, On the Street Where You Live, Show Me, I’ve Grown Accustomed to Her Face, are all completely lovely and I found myself singing to myself as I exited the theater. I think my favorite is I Could Have Danced All Night. It’s actually a very difficult song with a full octave range and some very high notes! The only songs I could do without are sung by Stanley Holloway as Eliza’s dopey father, a character I could also do without. Holloway is a good singer and you can see his Broadway background but the character is such a lazy bum I don’t really find it that charming. The ending isn’t my favorite. I would rather they went with the ending of the original play but I don’t hate it so much to ruin the film. I think with Higgins singing I’ve Grown Accustomed to Her Face moments before it feels more acceptable that he does love her and may treat her well. For Sherlock Holmes fans we get to see a young Jeremy Brett as Freddy Hill. He isn’t a super developed character but there is a charm to Brett’s performance. I like him and Hepburn in Show Me. The special release I saw is available for pre-order right now on Amazon with all kinds of special features. I know I have it on pre-order! Oh yes! This is an awesome film for sure. I saw it for he get first time back in 2012. Glad to know you enjoyed it too. I’d probably go with Little Bit Of Luck, Let A Woman In Your Life, & Get Me To The Church On Time. You? Oh, and Just You Wait, Henry Higgins. That one was funny especially at the end. While I don’t really “like” the film, I do enjoy the songs and the characters…which I guess is kinda weird, lol. I guess I was expecting more from the movie for me to “like” the movie, but the songs and characters are amazing! I too could go without Eliza’s father. I know his songs are popular, so I feel other people could sing the songs if we cut him from the film. Pingback: The Dressmaker Review – Reviewing All 54 Disney Animated Films And More!